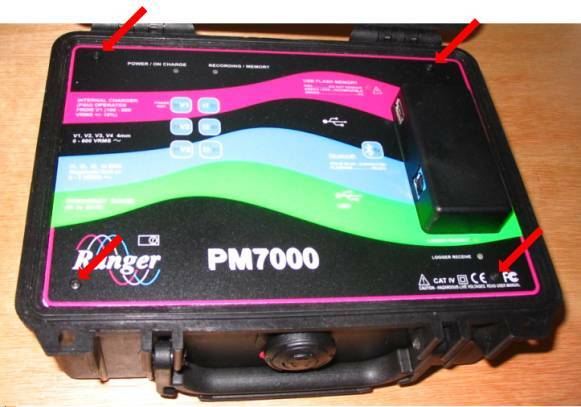 This application note details the sequence required to change the battery pack in the PM7000. the battery pack is an integrated package comprising thermal protection, internal fuse, welded leads and connector to mate with the PCB; all contained in a heat shrink sleeve. You will need a small ‘Posidrive’ screwdriver, a small flat bladed conventional screwdriver, side cutting micro-shears, replacement cable ties (zip ties). 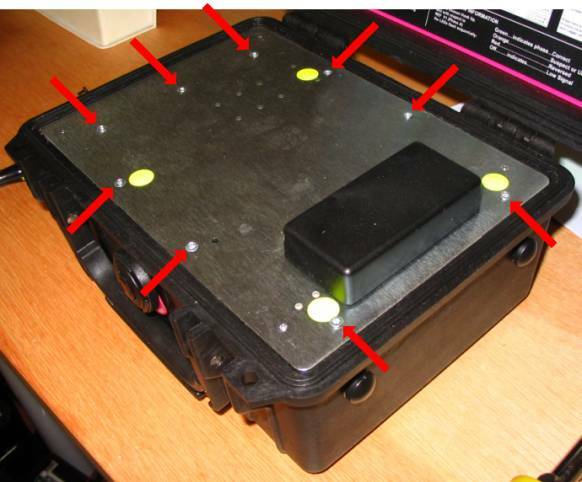 The battery pack is mounted inside the box just behind the handle, in a polycarbonate shell slid into position behind fixing inserts in the metalwork. 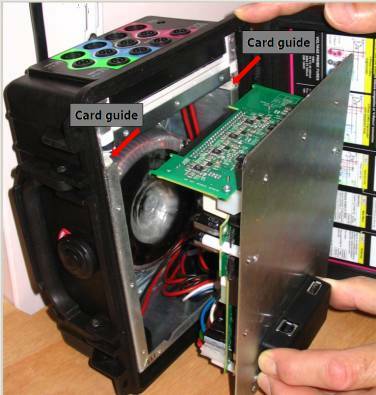 The battery pack is accessible after the electronics module is separated from the chassis. Stand the unit on end as shown in the picture below. It is helpful to lean the unit against a wall or solidobject as the weight of the metalwork and transformer in the chassis make itprone to fall over. The wiring harness is formed onto the PCB through 3 sticky backed cable tie bases using cable ties. Those three cable ties must be carefully removed leaving the bases undisturbed before the battery pack can be separated from the whole assembly. 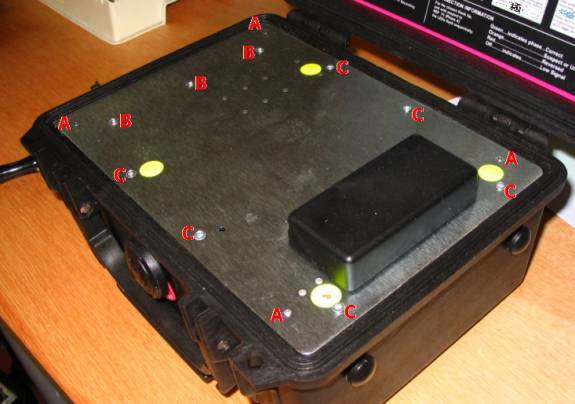 Battery packs may contain considerable stored energy even if almost discharged. This stored energy may be sufficient to melt insulation or induce burning of adjacent flammable objects. Even though the battery voltage may be low the energy release can be considerable in event of a short circuit. Take care to avoid short circuits and to manipulate the insulated wiring with care. 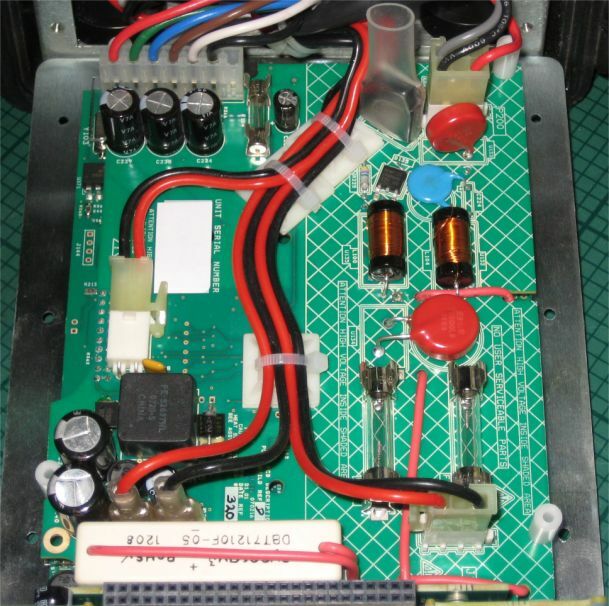 Leads in the wiring harness carry the full line voltage to the PSU. Make sure all insulation remains undamaged and free from imperfections before returning the unit to service. Carefully cut the zip ties holding the wires in position and remove them from their bases. DO NOT CUT THE WIRES OR DAMAGE THE INSULATION – THIS WILL CAUSE THE UNIT TO BE UNSAFE. 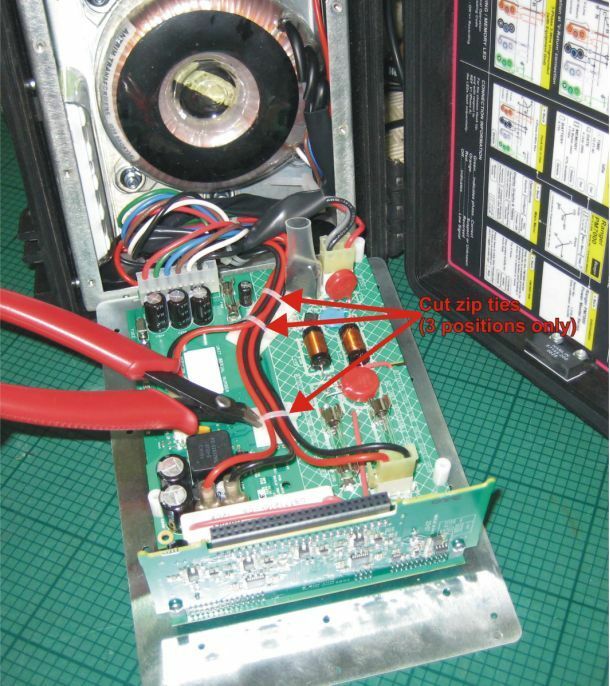 Disconnect the V1 input, Charger Tab Sockets, Transformer Primary, Transformer Secondary & Battery Pack from the Power Supply PCB. (6 connectors disconnected). Take care with the battery connections and avoid short circuits. 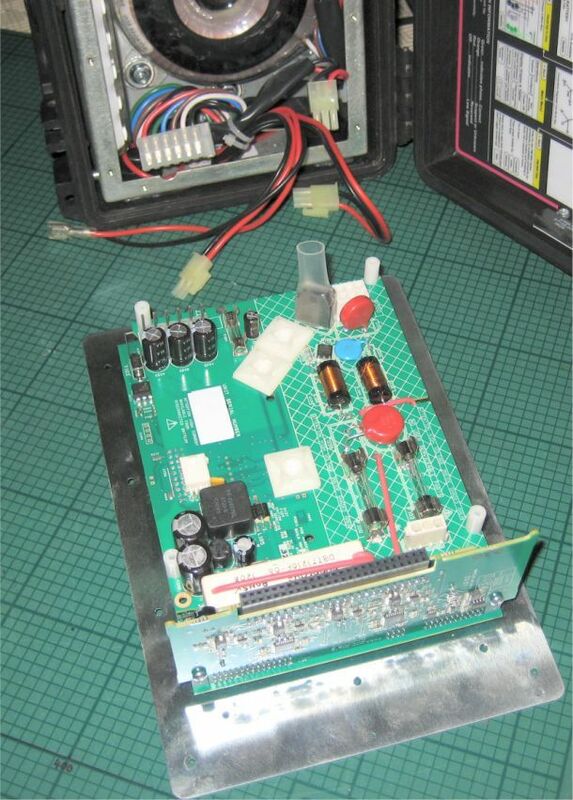 The battery is supplied as an integrated pack comprising thermal protection, internal fuse, welded leads and connector to mate with the PCB. The pack is mounted using a Polycarbonate shell that slides into position behind the inserts used to fix the front panel in position. An existing battery pack can be removed by first carefully undoing the nylon retaining screw in the plastic shell; reserve this screw for use when reassembling the unit. The plastic shell is removed by sliding the battery pack to the left by about 10mm – don’t go too far. A slot in the top lip of the shell allows the pack to be tilted away from the metal case so that the whole thing can then be released from the box. 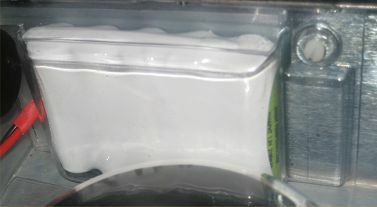 Some care is required to make sure the slots in the plastic shell clear all of the obstructions around the underside of the metal lip in the top of the box – when the correct position is found the battery pack will easily come clear without needing to apply undue force. The notes in the following subsections describe fitting a battery pack for the first time, including the fitting of cable clamps. Battery removal is straightforward reversal of this process. Normally it is not necessary to release the large cable clamp in the corner of the box when removing the battery pack. First confirm that there is 1mm of neoprene spacer at the bottom of the shell so that the assembly fits snugly. Confirm that there are no rough edges and that the insulation on the wiring is intact. 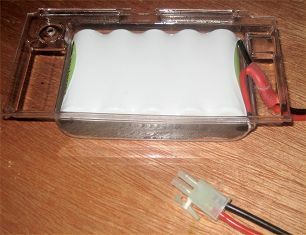 Confirm that the sleeve over the battery connecting leads pass neatly though the hole in the clear plastic shell – as shown. Fit the battery pack into the metalwork and slide along until the screw hole in the plastic lines up with the corresponding nutsert in the metalwork. Secure in place using a single M3x6mm NYLON screw (FEC 7070585) at the other end of the pack (NE431). All cables apart from the battery wires are routed through the RHS cable clamp. 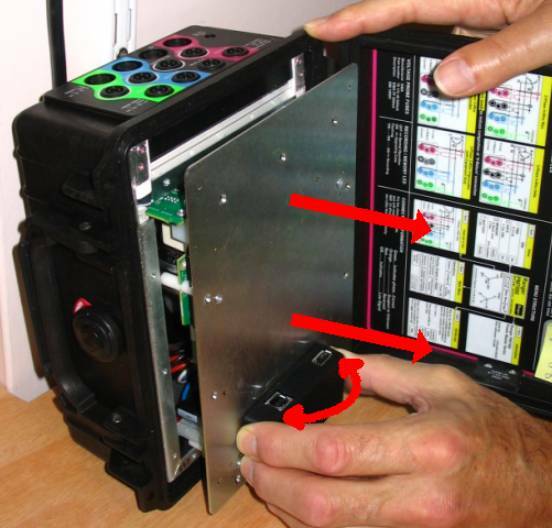 These should not need to be disturbed when replacing a battery but the routing is shown below for completeness. Confirm that the mains and charger cables pass neatly between the transformer case and the sidewall, passing through to the clamp to lie flat along the box wall like a ribbon cable. The wiring harness is formed onto the PCB through 3 sticky backed cable tie bases using cable ties. 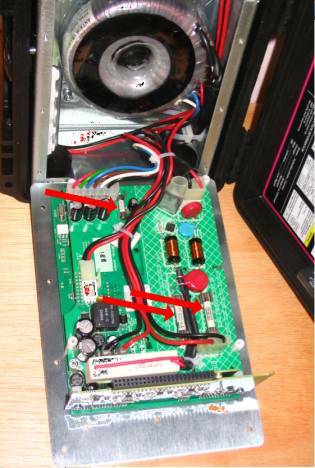 The connections must now be remade and the wires carefully reattached using new cable ties as illustrated below. Fit 3 new zip ties to keep the wires in position, the wires must be kept as flat as possible to clear the top of the transformer in the box when the unit is reassembled.